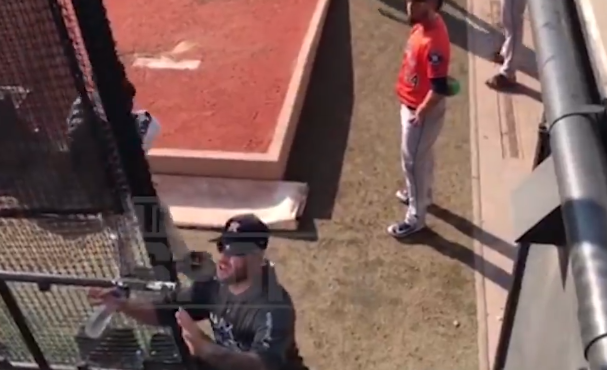 Ryan Pressly and a fan got into it over heckling towards Osuna. Ryan Pressly is backing up his teammate. On Monday, as the Astros took the field for Game 3 of the ALDS against the Cleveland Indians, a man in the fans started to yell at Houston closer Osuna, heckling him for his domestic violence arrest in Toronto. He’s trying to be a professional … but you’re coming over here being a dickhead, dude. Pressly eventually told the man he was “f*cking soft” before walking away. The heckler reacted somewhat aggressively, yelling at Pressly for cursing at him when he didn’t do that to him. Heckling Osuna is complicated. He did serve a 75-game suspension related to being arrested for domestic violence and assault back in May and charges against him were withdrawn back in September. Osuna wants to focus on baseball, but with that kind of suspension, he’s not going to easily escape the allegations – especially from rowdy fans. Pressly is probably sick and tired of hearing about it since the case has been resolved, but I’m not sure what he accomplishes by getting into with a fan.